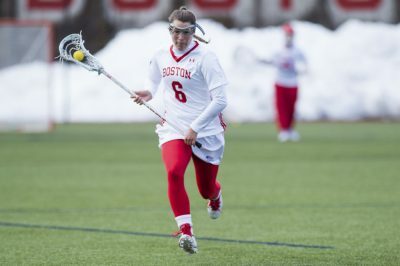 The Boston University women’s lacrosse team will look to build on its 9-6 Saturday victory against Bucknell University in its upcoming games against the College of the Holy Cross and the United States Military Academy. The matchup against Holy Cross (5-9, 3-3 Patriot League) will serve as the last home game of the 2018 regular season and will also be marked as the Faculty and Staff Appreciation Night. The Terriers (7-6, 3-3 Patriot League) are currently on a four-game winning streak and coming off a strong defensive performance against Bucknell (3-10, 1-5 Patriot League). BU head coach Liz Robertshaw noted the importance of the performances from the different units on the field that kept the contest low-scoring against the Bison. Sophomore attack Kailey Conry, who leads the Terriers in points with 60 and has notched a point in every game this season, had a four-point performance against Bucknell. Wednesday, the Terriers will face off against Holy Cross, which has lost three of its last five games and has alternated wins and losses since March 7. As a team, the Crusaders rank second in the Patriot League in caused turnovers per game (9.79). Three Holy Cross players rank within the top five in the league in caused turnovers per game, and sophomore midfielder Audrey Mandaro ranks first (1.79). The Crusaders are also third in ground balls per game with 20.57. Holy Cross is led by junior attack Keely Connors, who has scored in every game for the Crusaders this year, tallying 30 goals. She is the first player from Holy Cross to notch 30 goals in a season since midfielder Laura Ryan in 2015. In Holy Cross’ last game against Lehigh University, senior goalkeeper Julia Maloney recorded a season-high 16 saves and added two ground balls. In 14 games, she holds a .433 goal save percentage and 12.59 goals against average. The standout player for the Terriers in their last few games has been senior defender Maria Guerra, who recorded four caused turnovers and four ground balls over the weekend. Guerra also marshaled the defense to ensure that the Bison could convert only 24 of their 32 clears. Laible made her eighth double-digit save effort of the season with 10 stops in the net. BU will be hoping that freshman midfielder Ryann Gaffney can continue her strong form that has seen her score eight goals in the last four outings. The last time these two teams faced off, the Terriers came out on top, winning 10-9. After Holy Cross, the Terriers are up against Army (8-6, 2-4 Patriot League), which has fallen in three of its last four games. The Black Knights went down 20-7 to the No. 11 United States Naval Academy Saturday afternoon, and will take on Colgate University Wednesday afternoon before they face off against the Terriers. Midfielders junior Manuela Cortes and freshman Jackie Brattan lead Army on the offensive front, with 22 goals this season. Senior attack Amy Johnston is not far behind with 21 goals. Another layer that could prove to be a threat for BU’s defense is senior midfielder Rachel Hornick, who has 19 goals and 19 assists this season. The last time these two teams met, the Terriers edged the Black Knights in a 12-11 victory. Kyle Patterson contributed to the reporting of this article.